With all its epic battles, plot twists, and huge dragons, romance might not be the first thing that comes to mind when thinking of Game of Thrones. After all, many relationships on the show don’t exactly end well, even if they have given us some memorable scenes. But one couple has been through a whole lot since almost the beginning, and have managed to stay together. With the final season ahead, let’s take a look at Samwell Tarly and Gilly’s long relationship. Sam and Gilly first meet in season two, when the Night’s Watch stops at Craster’s Keep during their journey to investigate the White Walkers. Craster, the Wildling head of the refuge, lives beyond the Wall with his daughter-wives. Among them is Gilly, who is pregnant with Craster’s child. Because she fears what he might do to her baby if it’s a boy, she asks Sam to help her leave. Jon first refuses to take her along, then discovers that Craster is sacrificing his newborn sons to the White Walkers. Craster kicks the Night’s Watch out, but Sam, who’s taken a liking to Gilly, promises that he’ll come back for her. In season three, the survivors of the Battle of the Fist of the First Men (aka the intense battle between the Night’s Watch and the White Walkers in the season two finale) return to Craster’s Keep. Gilly gives birth to her baby – who turns out to be a boy, which deeply upsets her. When a mutiny breaks out as a result of disgruntled Night’s Watch members, Craster is killed, and Sam helps Gilly and her baby escape. They have a run-in with a White Walker who seems to want to take Gilly’s baby, but thankfully, Sam saves them by killing the White Walker with a dragonglass dagger. Not only does this act unveil an undiscovered way to kill White Walkers, but it also serves as a serious bonding moment for Sam and Gilly. After all, he literally saved her life. When they finally arrive at Castle Black, Gilly reveals that she’s named her baby Sam. Their relationship continues in season four, though they spend most of it away from each other. Sam, concerned for Gilly and Little Sam’s safety, moves them to nearby Mole’s Hill. Gilly hates it, and they don’t reunite until the Battle of Castle Black between the Night’s Watch and the Wildlings. Just before the battle, Sam swears again to protect Gilly and they share their first kiss. 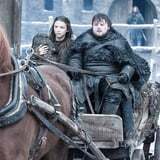 They also go further than a kiss for the first time in season five, after Sam attempts to ward off Night’s Watch members who try to prey on Gilly. Sam makes his way to the Citadel in Oldtown in season six. He hopes to become the Night Watch’s new maester after the previous one, Aegon, dies in the previous season. Gilly and Little Sam come along, and they stop at Horn Hill on the way, where they have an awkward meeting with Sam’s family. Sam’s father shames him for falling in love with a Wildling, and though he ultimately allows Gilly and Little Sam to stay at Horn Hill, he gives Sam the boot. Instead, they sneak off to make their way to the Citadel. Season seven ultimately sees them heading to Winterfell to support Jon. And of course, Sam realizes that Jon is actually a Targaryen thanks to Gilly finding the information. After all this time together, it certainly seems like Sam and Gilly are already married, especially because we’ve seen a handful of other weddings on the show. As this is Game of Thrones, none of them have had much of a happy ending. Since Sam and Gilly are still going strong, perhaps marriage is in store for the final season? That is, if they can find a moment to breathe with all the other crazy things that could go down! Previous articleHopping to Target as Fast as We Can to Stock Up on Easter Decor – Starting at $3!